KUALA LUMPUR: Sime Darby Property Bhd's (SDP) campaign, the Lifestyle Collection, has locked in gross sales of close to RM800 million since it was launched in early April. The sales were due to a strong take-up of residential and commercial properties located in Sime Darby Property's 10 known townships in the Klang Valley and Nilai, Negri Sembilan. As the campaign drew to a close on June 17, about 700 units of properties had been sold. Sime Darby Property saw an 80 per cent take-up rate for properties launched during the two-and-half month campaign, while some developments, including Aster Grove in Denai Alam, Delora and 11 Avenue in Bandar Bukit Raja, achieved a 100 per cent take-up rate. Sime Darby Property's managing director Datuk Abd Wahab Maskan said the results of the campaign was a clear indication that the company's product offerings had hit the right chord among home buyers and investors. "We offer them quality and innovative properties at a price that gives them investment opportunities and value creation. "The sustainability features provide value for money and create a sense of pride," he said in a statement yesterday. Abd Wahab, who is also Sime Darby's chief operating officer, said the support for its products was a reflection of the trust the buyers had in the Sime Darby Property brand. PETALING JAYA: Sime Darby Property Bhd recorded gross sales value close to RM800mil for its properties driven by its Property Lifestyle Collection sales campaign that had been ongoing for two months until June. In a statement, the company said the achievement came on the back of a strong take-up of the wide-ranging residential and commercial properties located in Sime Darby Property’s 10 known townships in the Klang Valley and Nilai, Negeri Sembilan. As at the campaign ended on June 17, it said a total of 700 units of properties were successfully sold. 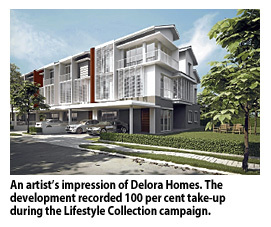 “The results of the Sime Darby Property Lifestyle Collection clearly show that our offerings have hit the right chord among home buyers and investors. We offer them quality and innovative properties at a price that gives them investment opportunities and value creation,” said managing director Datuk Abdul Wahab Maskan, who is also the chief operating officer. Furthermore, Sime Darby Property’s products that were launched during the campaign saw an impressive 80% take-up rate within the 2½-month period. It said some launches even realised a 100% take-up rate within the said period, namely Aster Grove in Denai Alam, Delora homes and 11 Avenue commercial development in Bandar Bukit Raja. “Our new strategic direction will be defined by our products, where quality, timely delivery of value and optimal returns are the hallmarks,” he said. The Naza Group of Companies, developer of the RM15 billion KL Metropolis project in Kuala Lumpur, is bidding for more joint-venture developments with Syarikat Prasarana Negara Bhd. Yesterday, the group's flagship property development arm, Naza TTDI Sdn Bhd, inked its first joint-venture agreement with Prasarana, to build a 26-storey condominium tower on a 0.4ha site in Taman Tun Dr Ismail. The land cost for the project is around RM12 million and it is expected to generate a gross development value (GDV) of RM153 million. Prasarana, a public transport provider, has about 8.4ha of undeveloped land along its Ampang and Kelana Jaya light rail transit (LRT) lines. It is awarding contracts on an open tender basis to help develop its land. This is to increase its non-fare revenue. According to Prasarana group managing director Datuk Shahril Mokhtar, the company will award soon a contract to develop land in Ara Damansara. Shahril said tenders to redevelop an abandoned building near its monorail at Jalan Tun Sambanthan will close on July 21. Prasarana has land in Taman Melawati and Putra Heights and the tenders will be called soon. 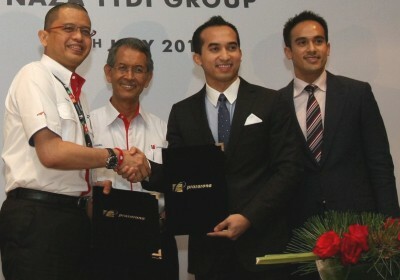 The joint venture with Naza TTDI is the second for Prasarana. The first was a deal it had entered into in March this year with a joint venture between Crest Builder Holdings Bhd and Detik Utuh Sdn Bhd to redevelop the Dang Wangi LRT station into a mixed commercial development worth RM1.04 billion. Meanwhile, Naza TTDI deputy executive chairman and group managing director SM Faliq SM Nasimuddin said the tower will house 186 condominium units, ranging between 650 sq ft and 1,200 sq ft.
Faliq said the project will be launched early next year and each unit will be priced at more than RM950 per sq ft. He is bullish on the property market outlook and expects the project to be well received by young executives and investors. Faliq added that the construction will be completed by the first quarter of 2016. "We hope this will be a long-term partnership with Prasarana. We are looking at more land to develop with them and will put in our bid when they call for a tender," Faliq said. The project will be developed on a profit- sharing basis with Naza TTDI Ventures Sdn Bhd taking 70 per cent. Naza TTDI Ventures is a wholly-owned subsidiary of Naza TTDI, and the company will be undertaking the bulk of the development work. PORT KLANG: Port Klang Authority (PKA) is teaming up with a developer, Lagenda Erajuta Sdn Bhd, to jointly develop its 16 acres in Klang into a landmark mix-commercial development dubbed 1Gateway Klang worth RM500mil. Official consent has been received from the Public Private Partnership Unit of the Prime Minister's Department for the commencement of construction work. The landowner of this project is PKA. PKA chairman Datuk Dr Teh Kim Poo said at a press conference that the project had already started its groundwork and would be completed in five years. “But I foresee the project to be completed earlier than expected as they had already started work since we already received approval for the building plan from the Klang Municipal Council. “The project is expected to be a landmark development in Klang, being strategically located along Persiaran Raja Muda Musa and Lebuh Turi which includes two hotel towers, a large shopping mall and offices. Teh hoped that this time around, the stalled project of more than six years would be a success. “The project was abandoned in the past due to the developer's insufficient funds. But, finally we have sorted out the problem,” he said. Teh said they had studied the background the Lagenda Erajuta and was confident of the company's track record and capability. “Lagenda Erajuta would have to pay PKA RM45mil as a guaranteed minimum amount for the cost of land that we are putting in,” he said. 1Gateway Klang, the first lifestyle street mall in the area, will boast of two 31-storey hotel towers, offices, gourmet zone, retail zone and leisure zone. With the prime location of 1Gateway, the developers intend to add value and prestige to the property. They have secured two internationally branded hotels, Novotel and Best Western Plus, to operate here. The food and beverage outlets will be located mainly on the ground floor duplex shoplexes and also in the upper ground floor. The upper ground consisting of three to six storeys of shop-offices will be zoned into leisure and business clusters with cineplexes, children playground, gaming arcades, leisure ventures, offices, banks, business corporations, signature retails, concept stores and fashion boutiques. Lagenda Erajuta has already secured many international, regional and local brands and is still actively identifying more branded retailers and operators to enhance the 1Gateway value. This area along Persiaran Raja Muda Musa has great potential to become the most lively business and social lifestyle enclave in Klang. The daily traffic flow of more than 60,000 vehicles along this major road is one of the highest in Klang. PORT KLANG Authority (PKA) and Lagenda Erajuta Sdn Bhd formed a joint venture to give Klang a new landmark by developing a RM500 million 1Gateway project in the royal town. Chairman Datuk Dr Teh Kim Poo said the project will be on a piece of 6.47ha of land in Taman Datuk Abdul Hamid along Persiaran Raja Muda Musa. It is expected that the project will be completed within five years. The commercial project will consist of two internationally branded hotels, office towers, Cineplex and shopping mall, he said. "Once completed, it will be a landmark in Klang," he told reporters at a press conference here, yesterday while adding that the site preparation work has already commenced. Official consent was received from the Public Private Partnership Unit of the Prime Minister Department. The landowner of the project is PKA. Initially, the land was a joint-venture project between PKA and Dermaga Suasa Sdn Bhd (DSSB) in 1995 and was called Intania project. However, it was stopped due to the 1997 financial crisis and was abandoned. Teh said as part of the joint venture agreement, Lagenda Erajuta have to pay PKA a guaranteed minimum amount of RM45 million for the cost of the land which belongs to PKA. Meanwhile, Lagenda Erajuta executive director, Datuk Lim Thiam Huat said in a press statement that the 1Gateway project will be a stylish top class commercial centre with high capital appreciation and rental yield. He said the area along Persiaran Raja Muda Musa has great potential to become the most lively business and social lifestyle enclave in Klang. He added that 1Gateway being the first lifestyle street mall in Klang will certainly bring back the younger Klang generation. "We are excited for this new impressive development that is prominently located. We are certain that it will bring about a new era of prosperity into the area, thus rejuvenating an area long neglected despite its real estate value potential," he said. Lagenda Erajuta Sdn Bhd is a subsidiary of Sagajuta (Sabah) Sdn Bhd. Sagajuta is Sabah's leading developer of the iconic 1Borneo hypermall, 1Sulaiman, Kingfisher Ujana and Warisan Square in Kota Kinabalu, Sabah. Khazanah Nasional Bhd and Temasek Holdings have kicked off their property alliance in the island republic with a S$7 billion (RM17.6 billion) central business district project. The Marina One development in Marina South is one of two big projects on six plots of land in Singapore to be undertaken under a joint venture called M+S Pte Ltd. The other project is at Ophir-Orchor. The joint venture stems from a land swap deal that Singapore and Malaysia agreed on in 2010 that included the development of the six parcels of land in Singapore. In return, Singapore gained six plots of Malayan Railway land - three in Bukit Timah and one each in Tanjong Pagar, Kranji and Woodlands. Khazanah has a 60 per cent stake in M+S, while the rest is owned by Temasek. 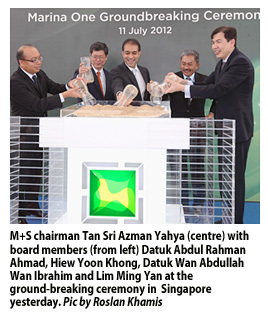 M+S' seven-member board is made up of representatives from Khazanah, Temasek and the private sector. M+S has secured S$5 billion (RM12.6 billion) loans from eight banks in Singapore to partly finance Marina One, which will have two office towers, two residential towers and a dash of retail units. At the ground-breaking ceremony yesterday, it was revealed that 60 per cent of Marina One will be for office space, 35 per cent residential, while the rest is for retail. The entire development will have a gross floor area of 341, 000 square metre or 3.67 million square feet, and be completed in 2017. Four of the six parcels of land parked under M+S will be developed under Marina One. "So far, the working arrangement (between board members of M+S) has been excellent, so we're pretty happy with the progress of the development," M+S chairman Tan Sri Azman Yahya said. Azman dismissed the notion that Singapore and Malaysia's delicate diplomatic and political ties will be a key issue to grapple with during the development of M+S' projects. "Well, not for M+S ... this is a very commercial organisation with commercial objectives. So we have made quite clear that our objective is to bring as much value to the land that we have ..., so its pretty simple. "It's a simple objective and like I to said, the whole relationship has been excellent," he said. Sunrise MS Pte Ltd, a subsidiary of UEM Land Holdings Bhd, is handling the marketing of the project while Mapletree Project Management Pte Ltd, a subsidiary of Mapletree Investments Pte Ltd, is the project manager. Recent developments around Marina South ranged between S$2,000 (RM5,000) and S$3,000 (RM7,500) per square foot. On the development of the two land parcels at Ophir-Rochor, Azman said its designs had been submitted for approval. Details will be revealed soon. The Ophir-Rochor development will be a combination of residential, commercial and a hotel. There will also be retail spaces. On whether M+S would consider venturing into projects other than the six parcels of land allotted to it, Azman said such prospect would be beyond the mandate given to the company. "Our mandate is really to maximise the value of these two (Marina South and Ophir-Rochor) parcels of land and make an iconic project that both parties can be very proud of," he said. M+S' projects in Singapore are estimated to have a gross development value (GDV) of S$11 billion (RM27.6 billion). Khazanah and Temasek also have a 50:50 joint venture in Malaysia called Pulau Indah Ventures Sdn Bhd to develop two plots of land in Iskandar, Johor, with an estimated RM3 billion GDV. 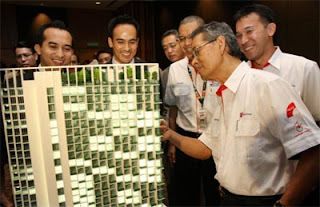 Condo project: Syarikat Prasarana Negara Bhdgroup chairman Tan Sri Ismail Adam (right)checking out a condominium model after the signing of a joint venture agreement between Prasarana and Naza TTDI Sdn Bhd for a condominium project in Taman Tun Dr Ismail in Kuala Lumpur. With him are (from left) Naza TTDI chairman SM Nasarudin SM Nasimuddin, deputy executive chairman and group managing director SM Faliq SM Nasimuddin and prasarana group managing director Datuk Shahril Mokhtar. 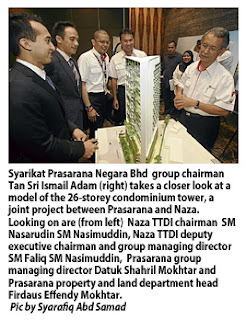 KUALA LUMPUR: Syarikat Prasarana Negara Bhd (Prasarana), which has teamed up with Naza TTDI Sdn Bhd to undertake a residential project in Taman Tun Dr Ismail (TTDI), has earmarked several plots of lands in the Klang Valley for property development. Prasarana group chairman Tan Sri Ismail Adam said the move to venture into the property sector makes sense. “Most of Prasarana's existing and future land banks are located at prime and populated areas. It will diversify the source of revenue for Prasarana,” he said at joint venture agreement signing between Prasarana and Naza TTDI for a condominium project in TTDI. “We have identified land in Ara Damansara, Brickfields, Dang Wangi, Putra Heights and the former bus depot land in Taman Melawati for development,” group managing director Datuk Shahril Mokhtar said. He said the tender exercise for the development on four acres in Ara Damansara had been closed and the tenders were now being evaluated. “Give us a couple of months. What happened is that we are getting the bidders to come in to propose what kind of mixed development will be suitable. We are not limiting them,” Shahril said when asked on the announcement of the successful bidder. Additionally, he said the tender for development on a two-acre site near the monorail station in Brickfields was still ongoing and was expected to closed on July 21. Earlier, Prasarana announced that its first property development along its rail line was on the site of the Dang Wangi light rapid transit (LRT) station which has a gross development value (GDV) of about RM220mil. It announced that a joint venture between Crest Builder Holdings Bhd's unit Crest Builder International Sdn Bhd and Detik Utuh Sdn Bhd had won the bid to develop real estate on the site of the Dang Wangi LRT station. Shahril said the details of the development on Dang Wangi site were still being finalised. He said venturing into the property development business would open new and constant non-fare revenue income for the group. “The fares for public transport are highly structured, and ours have not been reviewed for the last 10 years. Wherever there are opportunities to capitalise on our assets, we will go for it and it is a good sustainable business for the company,” he said. It was reported that Langkawi Development Authority would likely take over the operations of the Langkawi cable car services from Prasarana by year-end. Prasarana has been operating the cable car services via its subsidiary Panorama Langkawi Sdn Bhd since December 2002. Meanwhile, the joint venture between Prasarana and Naza TTDI Ventures Sdn Bhd, a wholly-owned subsidiary of Naza TTDI Sdn Bhd, will develop a condominium project with GDV of RM153mil. “It will be based on a 30:70 profit-sharing for Prasarana and Naza TTDI. The project will be built on our land valued at RM12mil, with Naza TTDI doing most of the development work,” Shahril said. Naza TTDI deputy executive chairman/group MD SM Faliq SM Nasimuddin said the 26-storey complex would house 186 condominium units of between 650 sq ft and 1,200 sq ft.
“This project is expected to start construction in the first quarter next year and completed by the first quarter of 2016,” he said, adding that the units would be priced at about RM950 per sq ft.
Ismail said Prasarana had been very strict with its evaluation process and Naza TTDI was selected from 33 companies which had participated in a tender process. PETALING JAYA: The Battersea Power Station project in London, which will be developed under a joint venture involving Sime Darby Bhd, SP Setia Bhd and the Employees Provident Fund (EPF), has good prospects due to the site's location, good take-up rates from neighbouring property launches and lower costs. CIMB Investment Research said it was more positive on the project following a recent visit to the site. “We like the location of the site and the fact that the property benefits from 400 metres of river frontage and forms part of the Nine Elms regeneration area,” it said. CIMB also said the wealthy residential neighbourhood would benefit the project. “The property is adjacent to Chelsea Bridge and is assessable by two railway stations, which are within a five minutes' walk. On top of that, there are plans to build an underground station (Battersea station) on the property as part of the Northern Line extension. “We drove around the Nine Elms area and saw three property launches near the site, namely the Embassy Garden, Riverlight and St George Wharf. We found that these launches have been selling relatively well,” it added. CIMB said the prices for new launches ranged from as low as £1,000 (RM5,000) per sq ft for the Riverlight project (which is very close to the Battersea site) to £1,200 (RM6,000) per sq ft for Embassy Gardens, which is near the proposed new US embassy and opposite the Riverlight project. The research house said its entourage that visited the site that comprised personnel from Sime Darby and SP Setia. The project represents the companies' maiden venture into property development in London. “Sime Darby and SP Setia announced last Thursday that they would each take a 40% stake in the joint-venture (JV) company, Battersea Project Holding Co Ltd, which would acquire the Battersea Power Station land. The EPF will subscribe to 20% stake in the JV company via its subsidiary, Kwasa Global (Jersey) Ltd,” it said. Battersea Project Holding Co, through subsidiary Battersea Project Land Co Ltd, had on July 4 entered into an agreement to acquire the property for £400mil (RM2bil) or £235 (RM1,176) per sq ft. The estimated development cost over a two-year period is £200mil (RM1bil). According to CIMB, the Battersea station site takes up 14.5 acres in the freehold land measuring 39.1 acres. The property is situated in front of the River Thames between Chelsea Bridge to the west and Vauxhall Bridge to the east. “The property is part of the strategic Vauxhall Nine Elms Battersea Opportunity Area Planning Framework, the largest urban redevelopment network area in central London,” it added.